I feel really guilty that I never got around to reviewing my Julep Maven colours this month because THEY ARE VERY, VERY GOOD. I think my consternation came from my attempt at reviewing the Plié Wand, a new invention by Julep that is designed to make nail application (and art) easy for all, so you can have your cake and eat it too. I cheated on my Bombshell subscription ONCE AGAIN because once I saw the gorgeous swatches for Boho Glam's Paulette and Jeanne, I knew I absolutely had to have them. When I received my box I liked the pastel blue creme Jeanne so much that I took off my polish IMMEDIATELY and put Jeanne on and for the rest of the week I got compliments about how pretty she was! It's one of the prettiest robin's egg blues I've ever seen! But let's not ignore the other two ladies at the table... Paulette is a gorgeous orchid with an irridescent golden shimmer. I haven't worn her yet, but I assume I'll wear her to a party wearing a floral dress, she's a very fancy colour. And last but not least, Ramona! I used my add-on spot for this super cute, very unassuming lavender creme. Ramona is a very soft, simple colour but she's just unique enough that I needed to grab her. Since I usually have a Bombshell subscription, what my box gets is two limited-edition nail colors and one full-size beauty product. A few months ago I got some fantastic liquid eyeshadows and last month a hyper-pigmented blush. This month that 'full size beauty product' was the Plié wand that Julep announced a few months ago. It is a tool to help those with steady hands so they can paint their nails easier, and allows for some variety with nail art. Personally I don't have any trouble painting my nails, and I assume anybody addicted to polish enough to get it in the mail every month is in the same boat. If the Plié wand was more of a nail-art tool I'd be more interested. But the wand only came with one extra attachment that just looks like a regular beush head, so it requires that you buy all the additional accessories like the dotting and striping tools to really get your hands wet with nail art. I'm not really interested in paying more to simply find some use for a product I already paid for. It's like a 'batteries not included' kind of thing. When I used it to paint my nails, I actually found the device clumsy and I did a poor job with lots of clean-up required, when usually I just need a dab or two. All my polishes and tools, all lined up in a row! This isn't my Waterloo or anything, I think Julep realizes that a lot of Mavens were a little stupefied by the product and have done a lot of work this month informing us about ways to use the product (See the chevron tutorial, Plié nail art from fans, top Plié tips, the birth of the Plié and more) so I'm willing to wait and see if my opinion changes with more use. That said, I wasn't too impressed with the swatches for the Maven offerings for June in the 'Three Wishes' collection. I know it's inspired by summer weddings but I already have a lot of colours like these from other brands already. Isntead I opted for the June 'Core Classics' box which takes two favourite products from previous months and brings them back. (Kalyn Lord has it here) which has the super popular Bare Face Cleansing Oil (for when my Shu Uemura from Topbox is done!) and the Beach Tonic Dry Body Oil. The body oil is $18 for a Maven and the Face Oil is $22, so all in all, this box is a steal! If you're looking to expand your polish horizons, I'm very happy with the colours and variety with Julep overall. It's especially good for those who aren't quite ready for indie polish addiction but who want to graduate from drugstore brands. And other than this month, I've been REALLY impressed with their beauty products too (this was a weird month, usually the beauty product is an actual PRODUCT, not a tool). 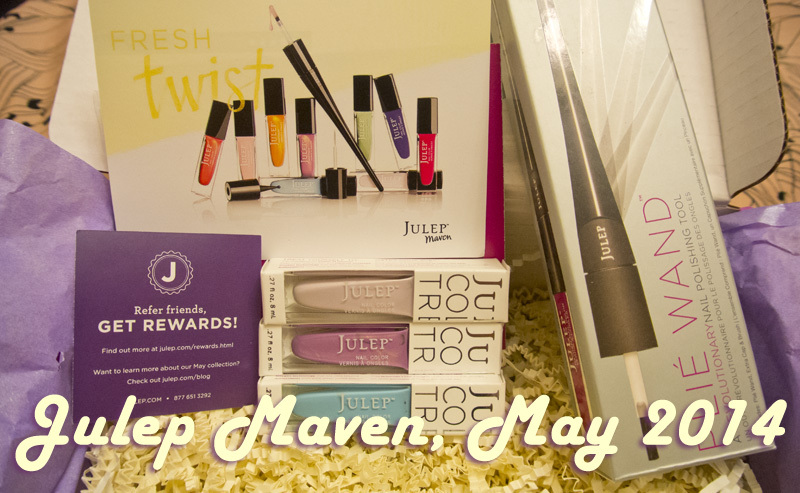 To give Julep a whirl, use my referral code to get a free welcome box with the code FREEBOX. These boxes change every few months but offer a few neat polishes and products for you to sample before you want to dive in. They also have a special summer box using the code HELLOYOU until supplies last. If you like it? You can join Julep by paying $19.99 a month for a quarterly subscription, or $24.99 for a month-to-month subscription. Don't want to subscribe after getting your welcome? Call Julep and cancel. Easy peasy, but I'd try a few months to see if you like their offerings. Being a Maven has upped my beauty and nails game, that's for sure! What did you get in May? Are you looking forward to June?